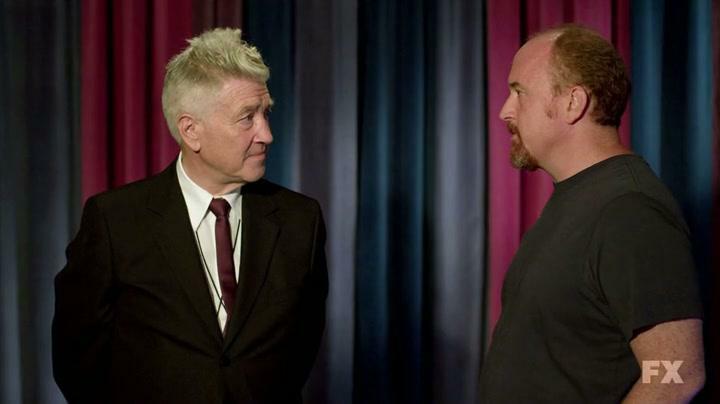 Louie Season 3 recap: “Late Show, Part 2” with David Lynch reviewed. This season has been full of doubles. Was Jay Leno really being that cutthroat? On the face of it, his advice was pretty sound. A network talk-show host, facing a broad audience and working under an immense burden of tradition is necessarily, to an extent, a square without an edge: a father tucking in his kids before bedtime. You stop being a comic’s comic like Louie when you step out from that curtain and fire your finger-pistol at the bandleader. More to the point, why would Jay consider Louie a bigger threat to Tonight Show ratings than Jerry Seinfeld? Does he really think that T-shirted, Brylcreem-deficient, wild-card Louie would “disrupt” the late night paradigm? Maybe. Maybe not. We can’t trust anyone in this episode—including, disconcertingly, Jack Dall and Alphonse, who are either the most inept, deflating coaches on earth or brutally effective adherents to the toss-the-baby-into-the-deep-end philosophy of self-improvement, playing a longer game. What’s great about Jack’s timing-is-everything dictate/truism is that trying to keep time to his cues is like trying to keep time to a pair of sneakers banging around a washing machine—he’s all irregular beats and sudden lurches; even his cue-cards are caked in the dust of bygone eras. Then we’ve got Alphonse, who sends Louie in against a serious bruiser for what is presumably his first-ever sparring match, offering him zero guidance, his crumpled, humiliating demise guaranteed. The loudest, heartiest laugh Louie gets in this episode is the one he needs the least: a cruel cackle from Shorty, Alphonse’s right-hand man, who appreciates the (inadvertent) slapstick genius on display when Louie, looking like a hairy baby in a jumper seat, eats the mat. This season has been full of doubles. Parker Posey’s and Chloe Sevigny’s it-girl bookstore clerks; Louie and surveillance-camera Louie; “Before” and “After” lady in the Leno gag; Jack’s two women secretaries (the second, blond secretary appears in close-up, answering Jack’s call letting her know he’s ready for Louie and Doug—like you, David, I outright missed the switch the first time). Doubles, as David mentions, recur throughout David Lynch’s filmography, and we saw Lynch himself doubled last night in my favorite moment of the episode: He’s standing on the mock set, smiling and gesturing in near-silence, but he’s doubled, in miniature, on the monitor, where his movements are set to music and applause. I love how those sound effects ground and naturalize a set of motions and utterances that strike us, at first, as seriously off. That’s show-biz; it’s a magic trick. Jack, the old dog, can hear, and bask in, the phantom cheers. Louie isn’t operating on those frequencies. There’s a fine observation tucked in there about the strangeness of doing comedy on television as opposed to doing it in a comedy club: Both experiences have in common a flesh-and-blood audience, except in the former, mediated instance, to a radical degree the flesh-and-blood audience doesn’t matter. They’ve been fluffed, they’ve got a giant applause sign telling them when to laugh and howl and clap. The real audience is, as far as the host is concerned, imaginary—an absent, unseen mass of people watching on couches at home, deciding his fate with their remote controls. Last episode we got backstage, backroom details in a way that crossed, pleasantly, into documentary territory. Last night, the vision of how a talk-show host is groomed and assembled was far more surreal and impressionistic—he’s forged in the Black Lodge. (Did you guys catch the backward-talking dwarf making Jack’s espresso in the background?) I’d have loved a bit more actual process and realism mixed in with the waking-nightmare vibes, but it’s another testament to C.K.’s accomplishment with these series how fluidly he’s able to switch between those modes.